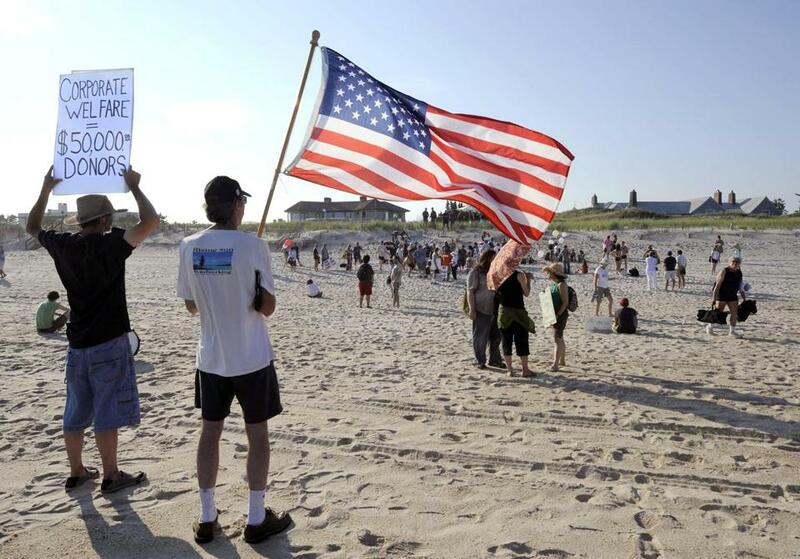 Protestors from MoveOn.org, the Occupy movement, and Long Island Progressive demonstrated on Sunday against a fund-raiser for Mitt Romney at the beachfront home of billionaire David H. Koch (house on right) in Southampton, N.Y.
President Obama’s reelection campaign continued to blast Mitt Romney on Sunday for offshore financial holdings and renewed its call for the presumptive Republican presidential nominee to release additional tax returns. The pressure followed a week of news reports about a Bermuda company Romney owned and transferred to a trust in the name of his wife, Ann, on the day before he became Massachusetts’ governor in 2003. The existence of the company, Sankaty High Yield Asset Investors Ltd., and other foreign assets — including investments in the Cayman Islands and a Swiss bank account maintained until 2010 — was not known to the public until Romney released his 2010 tax return and an estimate for 2011 in January. “The one thing he could do . . . to clear up whether or not he’s done anything illegal” is to release more tax returns, Robert Gibbs said. 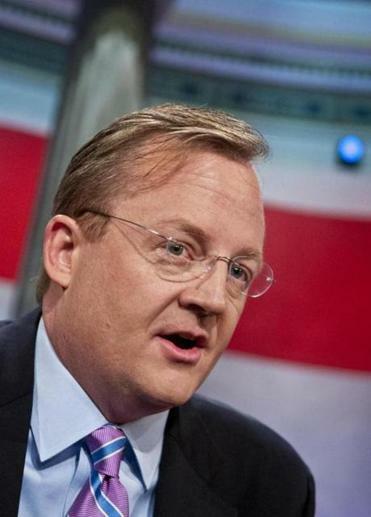 Obama campaign adviser Robert Gibbs suggested Sunday that Romney might have broken the law; at a minimum, Democrats say, Romney is guilty of secrecy and of betting against the country he aspires to govern. Gibbs’s claim that “every other presidential candidate” has released “a series of years of their tax returns” is not quite accurate. In 2008, GOP nominee John McCain released only two years of returns. And the Obama campaign’s demand that Romney release 23 years of tax returns — the number he shared with McCain while being vetted as a potential running mate — is unprecedented. According to a list compiled by PolitiFact, no presidential candidate since 1976 has released more than 12 years of tax returns. “Mitt Romney had a successful career in the private sector, pays every dime of taxes he owes, has given generously to charitable organizations, and served numerous causes greater than himself,” Romney spokeswoman Andrea Saul said in a statement. The significance of Romney’s foreign assets is unclear. Though it has used Romney’s offshore holdings to paint him as an out-of-touch rich man hoarding his wealth abroad, the Obama campaign and its surrogates have struggled to articulate why the investments are relevant to the election. In a video posted online Sunday, Obama campaign spokesman Ben LaBolt levied no direct charges against Romney but made his points with innuendo. “What taxes would Romney have paid if his money was invested here in America?” LaBolt asked. Moving Sankaty to his wife’s trust would not have allowed Romney to omit the company from his annual statement of financial interests. Presumably, he left Sankaty out because it was worth less than $1,000. If the company was worth more, Romney might have broken the law by not disclosing it, but the Obama campaign has not made such a specific accusation. Despite the vagueness of the Obama campaign’s attack, Romney’s team appears uncomfortable discussing the candidate’s foreign assets. Debating the issue with O’Malley on ABC, Bobby Jindal, the Republican governor of Louisiana and a possible vice presidential pick, repeatedly ducked questions from host Terry Moran.